Black bean chicken, pork, or beef is a Chinese takeout (and eat-in) classic. It comes together pretty fast but slicing the meat to the thinness you need to properly stir fry is a pain. Here we switch up the classic stir fry for a more chill-friendly slow but not-too-slow braise. You can have dinner on the table in less than an hour with little to no effort. 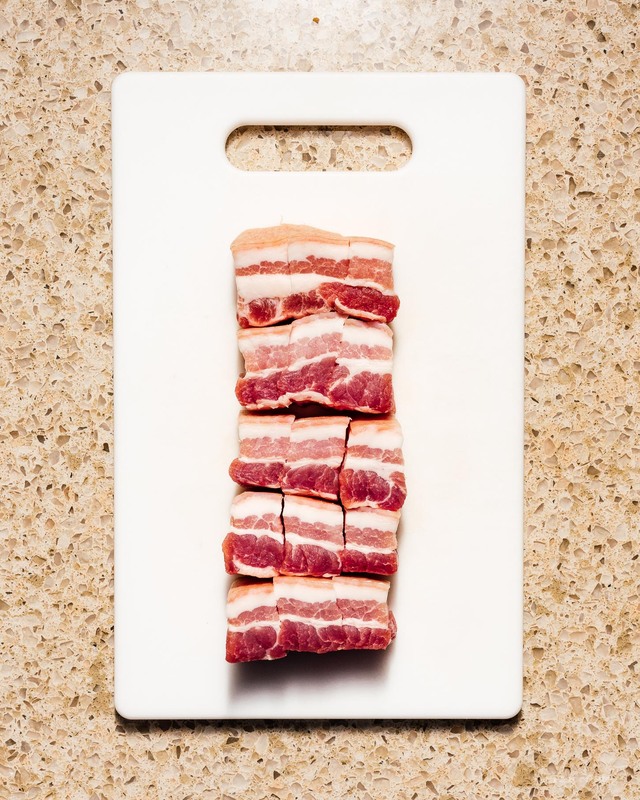 The pork belly can be cut however you like, larger pieces means longer braise times, smaller pieces mean more cutting. Why does this recipe work? Shaoxing wine is one of the signature ingredients of Chinese food, and if you have it, you should use it here. But if you don’t, buying it is an investment both in space and money – most recipes call for a tablespoon or less. It would take you literally years to get rid of it. Here we switch it out for a less authentic but no less tasty bourbon. A knife and a pot with a lid. Black bean sauce and oyster sauce can both be found in the international/asian aisle of any decent grocery store, or on Amazon by clicking those links. If you have some left over, you can make this black bean chow mein, claypot chicken rice, or the best noodles ever. Cornstarch is an optional ingredient that serves only to get that saucy texture you know from good Chinese food. Cornstarch can usually be found in the bulk section, so you can just get the two-ish tablespoons you need, but if you buy the nice package, you can make all these recipes with cornstarch. How do you serve it? With rice or noodles, of course. Optionally add in some onions and bell peppers to make a more complete meal. If you’re feeling adventurous, try it with this awesome ginger fried rice. 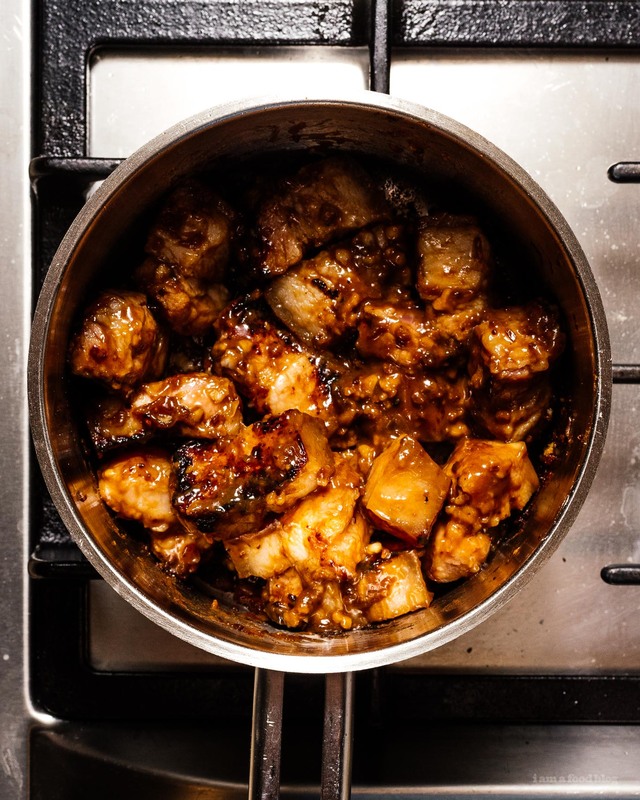 Pork and ginger are a match made in heaven. 1. 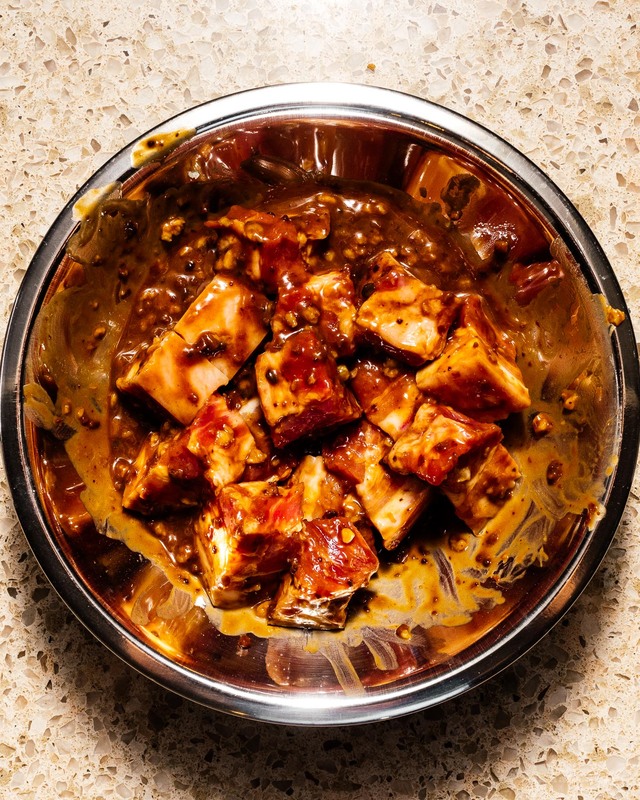 Cube your pork belly to your liking (I did 1″ cubes). 2. 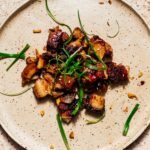 Combine remaining ingredients into a marinade and mix with pork belly. Marinate for 15 minutes. 3. Add a little oil to a pot over medium high heat. 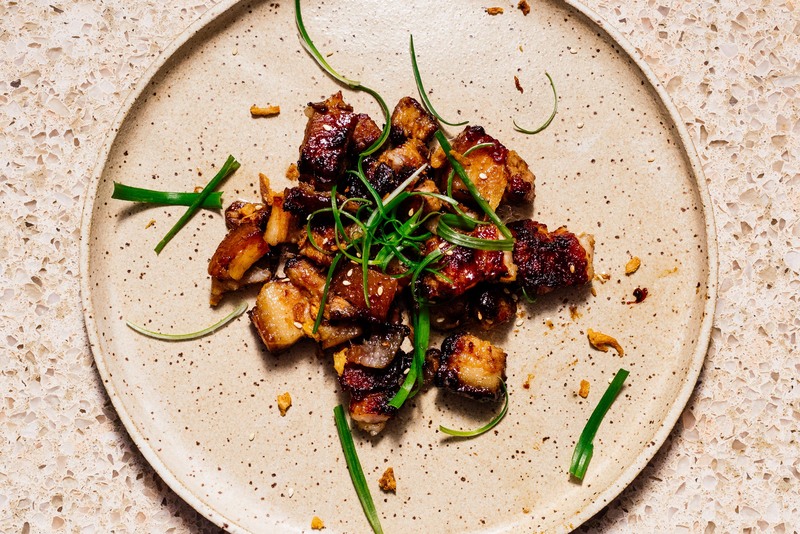 Remove the pork belly from the marinade. 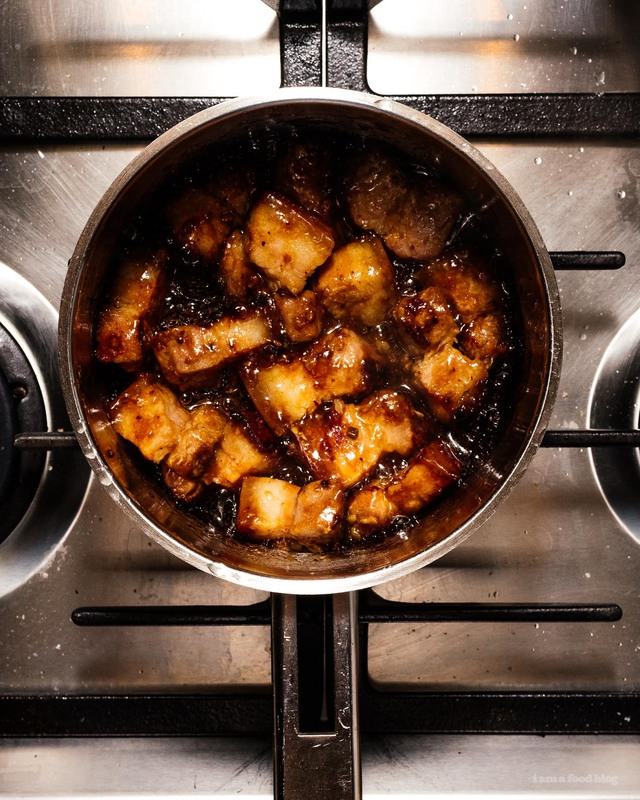 Lightly sear the pork belly. 4. Add the marinade to the pan and reduce heat to low. Cover and simmer for 45 minutes. Once done, check for texture and seasoning, then serve. Welcome to Dinner & Chill, a new series focusing on quick & easy weeknight dinners with easy to find ingredients, no special equipment, low prep, and low effort. Less shopping, less chopping, less mopping, more eating. Hi! Does your pork belly have the rind removed? Thanks.